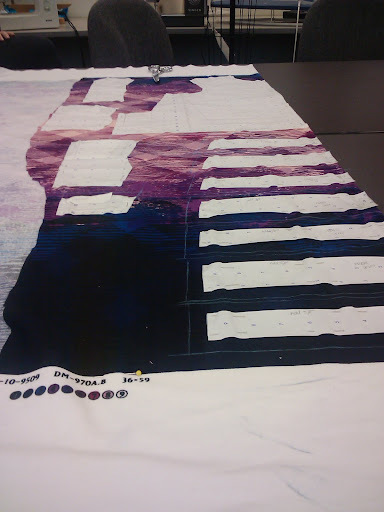 Photos from start to finish of my fabric manipulation project. 1. from the pattern and the cutting of the fabric. 2. The sewing of the actual garment, and matching it up and everything. 3. 4. The straps on the back, I had to individually iron, pin, trim, and flip inside out. So taking pictures of the process of creating a dress, is actually a lot more challenging than I thought, since I was so consumed by sewing, I almost forgot to take pictures. But I remembered! :) I really loved the way it turned out. I have been working with knits and patterns all semester, with my menswear jacket as well and also for my last project as well. wow, it looks really good, I love the back. Wow, this looks pretty awesome, you did a great job! That's amazing - I love it! That looks so amazing! Really, you are really talented. I love this. Wow, you are so creative. I love the colors/patterns. It's turning out beautifully! This is really beautiful Kelly, the work in it is amazing! This turned out great! I would totally wear that. Keep on keepin on! So close to winter break! You are amazing, come to Boston so we can work together please!! wow this is gorgeous! you did an amazing job. great post. Omg! That looks amazing. I love the back of the dress! Love the back on that dress! I love sewing too, a creative hobby I picked up from my grandmother! That looks really awesome! did you dye the fabric?? i don't understand the process exactly from the pictures, did you weave the whole thing together and is that interfacing?